Errors associated with Windows operating systems are not limited to PCs, tablets, and mini computers. You can also encounter a Windows error when using a Windows Smartphone. One such error is error 805a8011. This is a Windows error that many users of Windows Smartphones encounter. 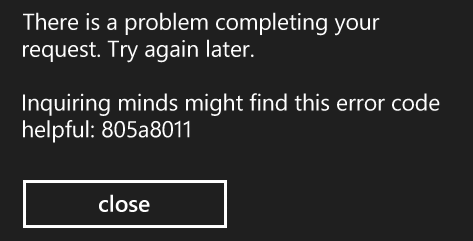 It is a very specific error that points to a problem with Windows Store. You are most likely to encounter the error when trying to access Windows Store or when attempting to download an app or update. Most of the times, the error is occurs on Lumia phones such as lumia 530, Lumia 535 etc. The occurrence of error 805a8011 leads to several difficulties. Not only can’t you connect to Windows Store; all installed apps also fail to connect to the Internet. It also becomes very difficult to access your messages and mail. Your phone may also restart every time you attempt to access Windows Store. It is very important to point out that Windows Smartphone system is a protected product. All system components are encrypted. Accessing Windows Store, therefore, requires the secure connection. This simply means that your Windows Smartphone must be verified and its certificate authenticated before it can download anything from Windows Store. Anything that interferes with secure connection or invalid certificate leads to connectivity errors one of which is error code 805a8011. Syncing problems with your Microsoft account. Inaccurate time and date on your Smartphone. Issues in your Smartphone’s Internet connection. Insufficient storage space in your Smartphone. Resolving error 805a8011 can be very simple or technical depending on the cause. Below are some measures and procedures you can perform to fix error code 805a8011 store. Simple housekeeping measures can easily resolve the error. Your first step should be to ensure that your Smartphone’s time and date are correct. Simply go to “Settings > Time and Date” to set correct values. Try accessing Windows Store to see whether or not the error is solved. Your Smartphone requires free storage space to perform at its optimum level. Lack of free storage space impairs its functionality. Consider deleting some data that is not necessary to create some free space. Such data can be old emails, photos, videos and music files. Do so before accessing Windows Store again to see whether or not doing so helps you to get rid of 805a8011 error. Because your Microsoft account may have synchronization issues, you need to synchronize it manually to see if doing so overcome the error. Tap your Microsoft account and hold it down. Tap on “Synchronize” before accessing Windows Store to see if this resolves the error 805a8011. Error 805a8011 can easily occur when your Smartphone’s Internet connection has issues. Consider switching from data to Wi-Fi connection or from Wi-Fi to data connection before accessing Windows Store to see if the error is resolved. The fact that the above methods do not resolve the error may mean that there are issues with your Microsoft account. Creating a new account can be helpful in overcoming the error. 2. Sign up for a fresh account. 3. Go to “Settings > Emails + Account > Add Email” on your Smartphone. 4. Enter the new username and password for your new Microsoft account and sign in. 5. Try accessing Windows Store to see if you are still encountering the error code 805a8011 in the store. This may be your last option in resolving error 805a8011. It is similar to formatting and installing a hard drive on a PC. It is, therefore, necessary that you backup all your important documents before you embark on resetting. There are two types of resets; soft and hard reset. It is recommended that you start with soft reset before you proceed to hard reset in case soft reset does not resolve the error. Step 1. Switch your Smartphone on. Step 2. Press down and hold the combination of Volume + Power buttons until you feel the phone vibrating. Note that your fingers should not touch any part of the screen at any time. Step 3. Release the Volume + Power buttons immediately the phone vibrates. Step 4. Your Smartphone should restart automatically. Try accessing Windows Store to see whether or not this fixes error code 805a8011 problem. Hard resetting your Smartphone is simply formatting it. You revert it back to the state it was in when it left the factory. There are two ways you can hard reset your Smartphone. It depends on whether it is responsive (if you can switch it on) or unresponsive (if it you cannot switch it on). Step 1. Tap on “Settings”. Step 2. Tap on “Restore your phone”. Step 3. Tap “Yes” in response to the warnings that you receive. Step 4. The process of resetting will automatically start. Remain patient because the process can take several minutes to complete. Your Smartphone should restart after the reset, and you will need to start installing or updating all apps afresh from Windows Store. The error 805a8011 should not appear anywhere. 1. Press down and hold the combination of Volume + Power buttons until you feel the phone vibrating. 2. Press down and hold Volume button immediately you feel your Smartphone vibrating. You should see an exclamation mark. 3. Press Volume up> Volume down> Power> Volume down one after another after the appearance of the exclamation mark. 4. Your Smartphone will automatically restart. The process will take some time to complete, and it is only appropriate that you remain patient. You will need to install or update all apps from Windows Store on completion of the process. Error 805a8011 should not appear again. It is always a good idea to prevent encountering any error. One way you can prevent error code 805a8011 is ensuring that it has sufficient storage space at all time. It is also a good idea to ensure that all system and application updates are installed to keep your Smartphone efficient. Time to go Android or iOS.